As I wrote in my last post (Chocolate Peanut Butter Spiders), there are some foods that are a must at an Australian kid’s party. Or really, at any Aussie lunch/afternoon function. And tradition dictates that there must be at least 1 item on the menu that has puff pastry as the primary ingredient. For if your lunch ‘do’ or kiddy party has no puff pastry, there will anarchy. 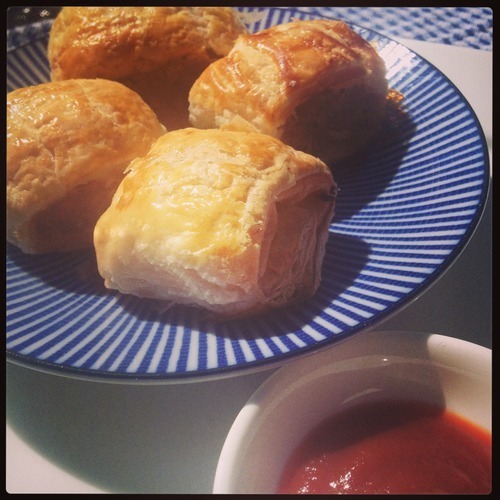 Luckily, I have just the thing for you; homemade Sausage Rolls. Sausage rolls are one of those foods that we’ve stolen from the Brits and made our own, just like the good old meat pie and the classic Sunday roast and 3 veg. They’re in every bakery, every supermarket, and in every grandmothers’ recipe book. In Australia, you can’t escape them and that’s just fine with us. 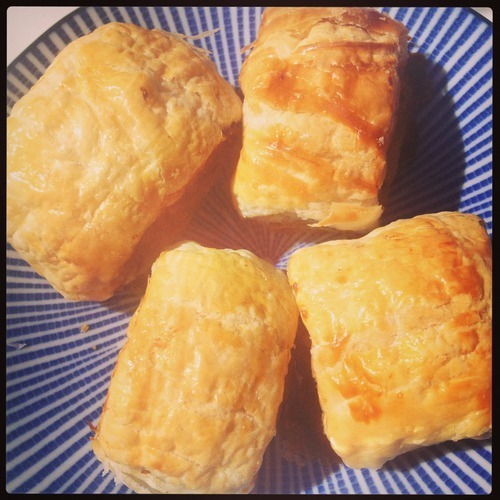 Sausage rolls and meat pies go together like Bert and Ernie, but if I’m going to be completely honest with you, factory-made sausage rolls are nowhere near as nice as homemade. The flaky pie pastry commercial brands use on sausage rolls flake right off the meat, and then to add further insult, it sticks to the roof of your mouth when you try to eat it! The meat is normally bland and dry, there’s a reason why we drown it in a bucket of tomato sauce. 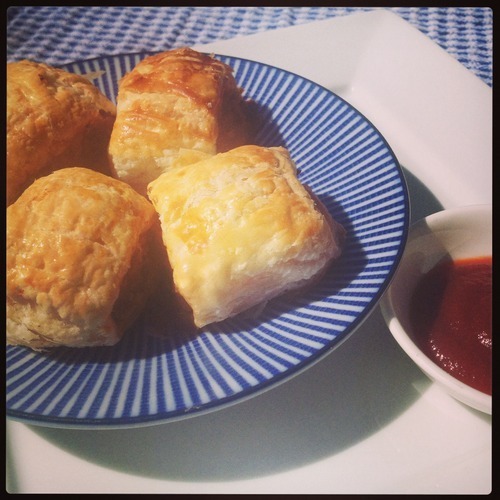 Country bakehouses are normally better, but I’m still more inclined to get a cheesy or a sweet chilli sausage roll than a plain one, I love a bit more flavour in my rolls. But the meat can still be a bit dry. I’m happy to say that these sausage rolls deliver on everything I believe a good sausage roll requires. Flaky puff pastry that sticks to the meat and not to your mouth, a nice herby meat mix that’s full of flavour, and no dryness in sight! But before I give you the recipe, I have to talk about sausage mince for a second. Please remember that not all minces are created equal! I’ve made this exact recipe 3 times recently with 3 different sausage minces from 3 different places, and each batch tasted differently. The best one by far was from my local butcher, then Woolies, with the strangest being from Coles. The Coles mince has a lot more fillers and felt goopier and stringier, the Woolies one had less fillers (but still had them) and was more ‘mince-like’. Both major chains were beef, whilst my local butcher had a beef/lamb mix. My old butcher in Singapore used pork, so if you do use your local butcher, don’t hesitate to ask what’s in their mince mix because it’s normally not written on the sign/packaging. I’d personally go for a local butchers mince; there’s less gunk in it and more proper meat, plus you’re supporting local small businesses which is always a plus. Yes, it does cost a little bit more ($10 per kg at my local vs approx $7.00 per kg at the major chain), but it tasted fresher to me and I’d rather my meat be more than just 70% of the total product. Again, just my opinion. You don’t even have to use sausage mince, you could use your favourite standard mince (pork, beef, chicken, veal, turkey, the possibilities are endless!) if you have a particular flavour in mind. Just give it a bit of a whizz through the food processor for a little bit to give it that famous sausage mince ‘goopy’ texture that we’re looking for. One great tip I was given by a former coworker of mine, back when I worked in auto retail (I wasn’t always a homemaker! I used to be able to tell if a Z9 or a BP5ES-11 would be able to fit your car, and I could size up a seat cover just by looking at a car seat! ), was to cook your sausage rolls on a crispy style pizza tray, you know the one with the holes in it? She even slipped one into mine and CTO’s engagement present, and I literally use it every day and especially for sausage rolls. Thanks Ms HLZ!! Mixing the mince mixture can be messy, so if you don’t want to get your hands dirty and you just happen to have a couple of kids hanging around, feel free to utilise them as mixing tools. I remember my mother doing just that 20 years ago. It’s squishy, gooey and slightly gross…. they’ll love it! 1 beaten egg, for brushing. Preheat oven to 180 degrees Celcius fan-forced, 190 degrees if not, then grease 2 rectangular oven trays or pizza trays with non-stick cooking spray. In a medium size bowl, add the mince, onions, 2 eggs, garlic, herbs, barbecue sauce and breadcrumbs. Mix together thoroughly using your hands. Let the pastry thaw slightly, then cut each sheet in half straight down the middle so that you have 8 rectangles in total. Brush each rectangle with some beaten egg. Divide the mince mixture between the 8 rectangles so there’s a ‘sausage’ lengthways down the middle of each sheet. Roll the pastry over the mince until it overlaps and forms a tube. Cut each tube in half for large sausage rolls or into sixths for mini sausage rolls. Repeat with remaining rectangles. Place sausage rolls on trays, overlap side down. Brush tops with more beaten egg. Move trays to the oven and cook for 30-35 minutes until golden brown. Notes: As always, cooking times and temperatures are a guide! You know your oven! I put a longer prep time as a guide because when I made mine, I was using 1 tray. Also, if the pastry doesn’t stick together when you roll it over, or your pastry gets too soft and gets a bit goopy, don’t worry it will still work and turn out fine.